Are you planning a conference, congress or educational event for the health travel and medical tourism industry? Of the over 4000 workshops and featured international keynote sessions Maria Todd has presented since 1989, more than 10% have been on topics of interest to medical tourism sector stakeholders. Her reputation and following is well-established in the industry as a professional workshop leader, keynote speaker, and author. Offer the informative and interactive training workshops your attendees want to attend. Learn about fees and travel requirements for workshops and on-site training sessions, keynote sessions and webinars about the business of medical tourism and health and wellness travel presented by Maria Todd. Maria can provide excellent references from past clients at globally renown healthcare brands and from meeting planners and event coordinators. Maria is a popular presenter and often booked as much as 18-24 months in the future. With over 35 years of experience working in the business of health & wellness travel and medical tourism around the world, Maria can connect you to other vetted and professional speakers, university professors, facilitators and referral partners, investors and other industry stakeholders. Please call her office or email her to learn more. Maria Todd, author of the best selling book in the industry, the Medical Tourism Facilitator's Handbook offers practical strategies and tactics to collaborate with medical tourism referral partners in the USA and abroad. Included in the course materials are sample contract templates, checklists, and model forms you can use to vet qualifications, evaluate their value proposition and risk or benefit to your professional or facility brand. This course is appropriate for both providers and facilitators. Learn how to address specific issues related to liability for professional conduct, quality, safety, and handling of sensitive personal information of the patient. Medical Tourism is sold in package arrangements, but many medical tourism suppliers could use a little help to improve their strategy on what to include, how to price their packages, and how to market them to their competitive advantage. In this one-day hands-on workshop for medical tourism suppliers (doctors, dentists, hospitals, health resorts, facilitators, tour operators and travel agents) you'll take home checklists, formulas, sample contracts, and more. Maria Todd shares lessons learned and know how from more than 30 years in the medical tourism business. Package Pricing for Medical Tourism goes beyond the medical episode of care bundling to include post-acute care, accommodation, rehabilitation, private duty nurse options, sightseeing, and more. Medical Tourism is about more than simply booking appointments with medical, dental, and rehabilitation or spa providers for surgery, rehab or consultation. Learn how to develop the destination to attract investment, industry and tourism to your location. After you've attended this one-day, hands-on, interactive workshop, you will take back a blueprint to develop your medical tourism destination for a profitable future through economic growth, jobs creation, and brand awareness. Maria Todd leads the workshop and provides interesting ideas and practical case studies of what went right, what went wrong, and how to focus on locational features for attracting business and revenues to your city, region, or country. Her class fills an important void in the education and panel discussions missing from the literature and at many international conferences. She shares practical guidance on how to advantageously position your medical tourism or wellness destination in an increasingly and demanding competitive marketplace. Every forward looking Mayor, Economic Development Manager, CVB, or Tourism Board Manager should attend this information-packed workshop. Many hospitals and clinics seek to attract international medical, dental, rehab and dialysis tourism patients. Unfortunately, they are often confused by claims from various sources advertising that it is easy to get contract with health insurers outside their market. The truth is, very few insurers cover "elective medical tourism" procedures, per se. In this practical skills-building workshop, Maria Todd covers the information you must know before you approach insurers and employers, including the types of group health purchasers you may encounter, what they want to buy, how they want to buy it, and what you must be able to provide as a compelling argument to do business with you. Learn the things that all the panel presentations at international conferences don't have the time or presenter know-how to deliver. Contracting with American Insurers and Employers is a focused, three-day, hands-on workshop that covers product and pricing strategies, and teaches participants how to analyze and negotiate complex American insurer contracts for healthcare services reimbursement. This class is designed for international hospital and clinic managers, executives, and marketers outside the USA. Maria Todd takes class participants through an overview of 25 payer organization and insurer types, typical American health insurer reimbursement models, and purchasing objectives. As a former contract negotiator for a large HMO and several self-insured employer plans, she brings you the rare insights and highlights the concerns of payer and employers of American insurers and employers. Join Maria Todd as she brings you 21 hours of education teach you the things that panel presentations at medical tourism conferences and events cannot teach in ten-minute presenter slots. She'll bring you tools, tips, checklists, and techniques to improve your contract negotiations and prepare you for success. Maria Todd is the only expert in the world with 30+ years of hands on payor contracting experience, hospital and clinic management experience, and medical tourism business development experiences. This training is not available anywhere else in the world. The unique perspective she brings from this rare combination of hands-on professional work experience is sure to benefit your organization and give you a competitive edge and better, more profitable contracts. Get into the minds of your buyers and create proposals that are relevant and compel them to want to do business with you. Learn how to protect yourself from ambiguous contract terms that could end up costing you margin and risk of cost overruns and loss. Learn what you must do to protect yourself from denied claims after you've already pre-authorized treatment. How to Buy Medical Tourism Services for Group Health is a one-day, information packed workshop for ERISA and Taft Hartley plan sponsors and plan administrators. This course is designed to take you through benefit design issues, vetting and provider /destination selection for both domestic and international health travel benefit design, operations, and provider network development. Employers can use health travel benefit options to create a narrow network program of 4-6 destination options for specific types of procedures. 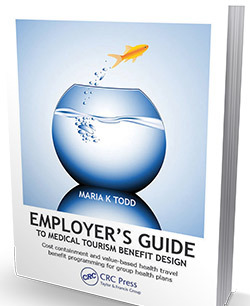 Maria Todd, author of The Employers' Guide of Medical Tourism Benefit Design applies her knowledge of ERISA and Taft-Hartley regulations, plan administrator concerns, bundled case rate strategies and disintermediated negotiation with healthcare suppliers to help participants understand the issues, risks, and benefit satisfaction concerns associated with the launch of a medical travel program. She shares insights on actuarial and underwriting hurdles, population health and incidence frequency for cases that are best for medical tourism. She also discusses how medical travel can reduce or mitigate risks for Cadillac tax liability, and how to develop or incorporate a private exchange program that can include a medical travel benefit. She discusses how many of the services can be allowable under IRC-213D, and how to structure a health travel limited expense, reimbursement only HRA program or utilize the benefit with HRA and HSA or flex account programs. She also explains how your lasered claims and conditions can benefit from a domestic or international medical travel option steered to Centers of Excellence and better outcomes. In this one-day, critical analysis workshop, Maria Todd reviews the realities and misconceptions about the perceived and real value of international hospital accreditation as it relates to medical tourism and health travel. Get the insight you need to put accreditation in context. Before you invest about $250,000 on preparation, gap analyses, mock surveys, document creation, consultants, fees, and surveyor travel costs and fees, for 3 years, you should attend this informative program that will send you home with insights on which accreditation scheme will benefit you the most, how buyers really perceive the value of accreditation, and how group health insurers view the extra cost layer to have a licensed logo plastered on your marketing materials and break-even pricing formulas. Hospital and clinic managers, quality managers, international patient department managers, medical tourism facilitators, tour operators, travel agents and economic development officials at medical tourism destinations. Maria Todd has been guiding hospitals, healthcare facilities, ambulatory surgery centers and long-term care facilities through the process of accreditation preparation, inspection surveys and remediation of deficiencies. She and her team have decades of experience in guiding organizations from 15 countries through accreditation and re-accreditation readiness. But she has also worked on the buyer side at insurance companies and with employers and unions who purchase group health solutions from accredited hospitals and health facilities, academic medical centers and same day surgery centers and office-based surgery providers for the last twenty years. Learn what value and significance they place on accreditation before you try to sell them on the fact that you have it or are planning to seek accreditation. The insights may surprise you! In Kickstart Your International Patient Department, veteran medical tourism expert, Maria Todd, shares more than 3 decades of practical experience from projects in the USA and abroad. She brings her experience from working as a hospital administrator and ambulatory surgery center CEO, and work as a medical tourism facilitator, surgical nurse and insurance provider contracting manager to teach workshop participants about what's involved in planning and launching an international patient services department at a hospital or ambulatory surgery center. Whether you are planning to integrated existing assets or those that must be developed into a campus setting similar to the model at the Cleveland Clinic at its headquarters in Ohio, or you have a smaller scale operation in mind stitched together from local value chain suppliers, Maria can explain what's involved and how to prepare. She provides sample template workflows, checklists, job descriptions and skills requirements, quality documentation templates, and sample forms, policies and procedures developed over 3 decades of work in the industry. There's no other place you can take this course except from Maria Todd, because it is not offered at international conferences and congresses where speakers are only permitted 10 minute panel presentations and 60-90 minute breakout sessions. No other expert has the combination of healthcare administration, medical tourism business development, surgical nursing and healthcare provider contracting across a 30+ year career. Maria will share lessons learned and practical tools, tips, and techniques to shorten your learning curve, accelerate your go to market timeline, and avoid costly oversights and mistakes. Medical tourism is a growing industry and travel agents have as much chance (if not more) to succeed in developing a medical tourism referral agency as any medical tourism facilitator. They just have to want to do so. Maria Todd was a travel agent with AAA's WorldWide Travel Agency more than 30 years ago before transitioning to healthcare administration and surgical nursing. She is one of the very few in the industry with strong travel business experience as an agent, tour operator, hotel inspector, and travel planner who then added the skills from nursing and healthcare to become a tour de force in the health tourism and wellness travel industry. In this two-day workshop designed especially to fill in the gaps for professional travel counselors, Maria Todd explains what travel agents must know or study to become medical tourism powerhouses. The advantage that a travel agent has over a medical tourism facilitator is the access to the GDS, IATA registrations to be able to book commissionable packages for tours, hotels, spas, resorts, and area attractions. Facilitators are unable to do this without IATA credentials, nor are they able to use the GDS to book airline tickets. Maria Todd takes the professional travel counselor with experience and teaches the nuance of medical travel planning, risk mitigation, and bolts on the medical services component to their existing knowledge. In this three day Medical Tourism for Travel Agents workshop, Maria begins with an overview of the medical travel industry, how it works, where the key destinations are and their strengths. From there, she begins explaining the language of medicine, dentistry, rehabilitation, using an approach that combines prefixes, roots and suffixes. Combined with an overview of applied anatomy and physiology, the professional travel counselor is then able to decipher the medical needs and converse at a more educated level with healthcare professionals. Once the terminology has been reviewed, she uses scaffolding teaching strategies to connect the new and old background knowledge to teach participants about the more common medical procedures that are appropriate for a new medical tourism planner with minimal risk. She integrates realia (real life) tangible objects and lessons into the workshop syllabus to explain the procedures, instruments, wound approaches and how they all interrelate to travel planning and accommodation choices for medical tourism clients. To accelerate application and assimilation of lessons learned, each student receives a USB drive with a variety of templates, checklists, inspection guides for use during hospital, hotel and airport site visits, ground transportation inspections and package supplier collaboration. Students also learn the significance of hospital accreditations, certifications and how to contract for services so that the travel agent avoids taking untoward risk for medical and other service organizations. Finally workshop participants learn how to market and advertise for medical tourism services and charge for their professional coordination services. Template contract models are supplied as a part of the handouts for take home use. Travel agents with 3-5 years of full time, professional work experience. Health and wellness tourism travelers have special needs in addition to general travel needs. Savvy marketers of health and wellness tourism products and programs realize these and meet these needs with compelling solutions. If you don't understand your target market or have no target, it will be almost impossible to get traction for your health and wellness tourism destination and the services you sell. Today, travelers seek personalized experiences in hotels, spas hospitals, clinics and destination activities whether it involves streaming their own content, exercising in the hotel gym exactly how they like, fluffy foam or feather pillows, or exploring local neighborhoods with guidance from their destination advisors. The closer you can come to matching how they live at home and and translate that to how they live on the road, the more relevant and compelling your offer will be. Especially if you can make your offer seamless and worry free. The crux of this is relevant amenities. You can't do either if you aren't able to identify your target customer's needs, travel habits, dining preferences and entertainment and leisure time activities preferences - and tolerances post operatively. Maria Todd is the editor in chief of Medical Tourism Destinations of Distinction, a new lifestyle and travel magazine that features 3 health and wellness destinations each issue. In this one-day workshop, Meeting the Needs of the Health & Wellness Tourism Travelers through Big Data, Maria Todd shares the importance of big data and its translation into information that is useful to create compelling campaigns, destination package offers, and market them digitally. In this workshop, participants look at the broader trends that are happening in health and wellness tourism, the trends towards personalized amenities and really knowing the guest. Maria Todd also examines branding and how that translates within brands at destinations. She explains the importance of building a technical infrastructure that can scale across all consumer touch points and the little nuances as well. Good public relations can put your medical tourism business in a favorable light, but it's a commitment of time that many medical tourism facilitators and referral agencies may not want to invest. In Public Relations Techniques and Tactics for Medical Tourism Facilitators, Maria Todd explains the reasons for engaging in public relations. For starters, doing so is affordable and easy on a startup's budget. While public relations demands a lot in terms of personal commitment, it is what you do when you aren't coordinating patient trips. Many medical tourism facilitators realize after they start the business just how precious time is. In the early days of your business, you may find that you have an abundance of time and very little cash to use for marketing, consulting, and business development. Maria Todd developed medical tourism booking software with 3 partners in Germany. She developed the first and only Globally Integrated Health Delivery System, a network of more than 6000 hospitals and 850,000 physicians and dentists and therapist across 5 continents. She has received widespread positive publicity, awards and interviews with numerous columnists and been hired to deliver the keynote addresses, plenary sessions and pre- and post-conference workshops at many industry events around the world. Unlike many speakers who talk about marketing and operating medical tourism referral agencies, Maria Todd shares more than 30 years of hands on experience and lessons learned to the workshop to the benefit of workshop participants. Medical Tourism facilitators and referral agents who launch a public relations plan must first have a well-developed marketing program with a consistent and professional image. Maria addresses how to know if you are ready and how to pitch your value proposition to gain media trust and attention. She explains how to market yourself and your expertise to your local media as the local medical tourism destination and services expert, She explains how and when to seek out speaking opportunities, how to pitch articles for local media outlets, how and when to provide press releases, give interviews to the media and participate in local chamber of commerce and other networking events. She explains how to tie your campaigns and activities together so that everything appears professional and supports the other actions and tactics. Maria explains how success begins with attention to details such as your email account and carries through to your social media, advertising, email marketing, website and blog. These should all have an internal consistency and goes a long way to crafting your brand image. In Public Relations Techniques and Tactics for Medical Tourism Facilitators, you'll learn the one thing many novices are unclear about: the objective of the reporters. You'll come to understand how uninterested they are in promoting your business. You'll come away with tactics you can use to pique their interest and come back to you time and time again when you meet their objectives for their story. Maria shares more insights about how to present comments so that they are not seen as shallow, unprepared, or biased. She challenges workshop participants to prepare good story ideas and quotes to supply to the media in exercises performed in class.